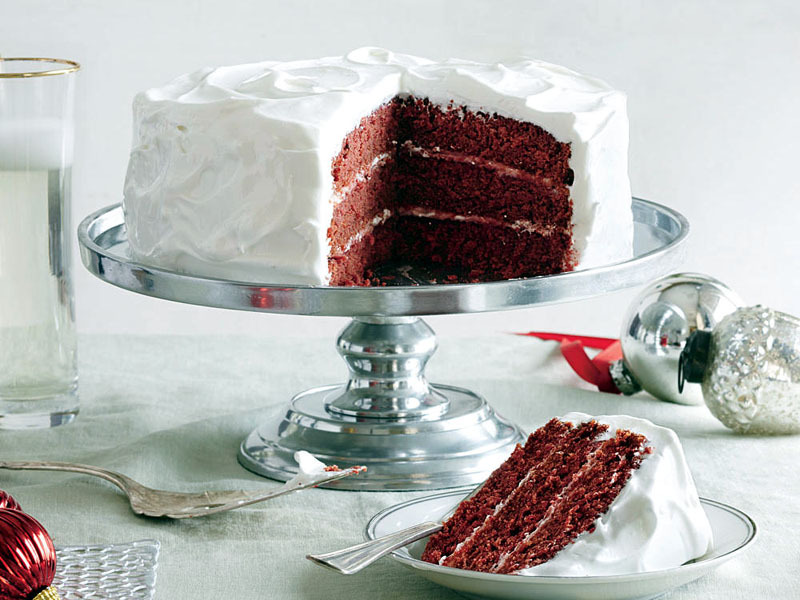 Just the name "red velvet cake" suggests something elegant and rich—dramatic, supermoist layers of tinted chocolate cake. Our secret weapon: red beets. Cooking the vibrant-red, naturally sweet vegetables with nonfat buttermilk and vanilla, and then pureeing them into a luscious cream adds an ultramoist, velvety texture to the cake that also allows us to use less oil and butter—a savings of 255 calories and 22g fat. Double bonus: The red beet color eliminates any need for artificial dye. And rather than weigh down the entire cake with a cream cheese and butter icing, we create two frosting elements: Between the layers, we spread a light cream cheese and Greek yogurt filling, sweetened with a touch of sugar and whipped until fluffy with a splash of cream. Then we cover the entire cake with a fluffy, cloudlike meringue—a decadent white icing combo that saves 344 calories and 16g sat fat over cream cheese buttercream. 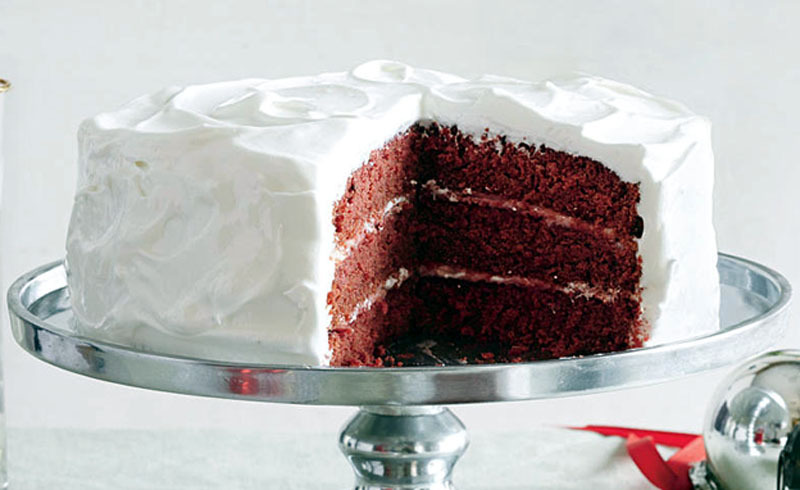 It's the dramatic splurge you'd expect: tender, moist cake with rich, creamy frosting—for only 284 calories per slice. You simply can't "beet" it. Hands-on: 48 min. Total: 2 hr. 7 min. Place beet in a food processor; process until very finely chopped. Remove 1 cup beet from processor; reserve remaining beet for another use. Combine 1 cup beet, buttermilk, and 1½ teaspoons vanilla in food processor. Process until very smooth. Weigh or lightly spoon flour into dry measuring cups; level with a knife. Combine flour, cocoa, baking powder, and ½ teaspoon salt in a bowl, stirring well with a whisk. Place 1½ cups granulated sugar, butter, and oil in a large bowl; beat with a mixer at medium speed until fluffy (about 5 minutes). Add eggs and 1 egg white, 1 at a time, beating until incorporated. Add flour mixture and beet mixture alternately to butter mixture, beginning and ending with flour mixture. Divide batter evenly among 3 (8-inch) round metal cake pans coated with baking spray. Bake at 350° for 23 to 24 minutes or until a wooden pick inserted in center comes out clean. Cool 15 minutes in pans on a wire rack. Remove cake from pans; cool completely on wire rack. To prepare filling, place cream cheese, cream, yogurt, ½ teaspoon vanilla, and dash of salt in a medium bowl; beat with a mixer at high speed until smooth. Add powdered sugar; beat at low speed 1 minute or until well combined (do not overbeat).